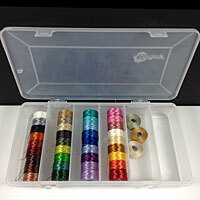 36 bobbins of C-Lon Bead Thread Size AA nested in one 6 compartment bobbin box. 4 compartment hold the bobbins. The last 2 compartment is free to hold extras bobbins, needles or anything you may want to store. BONUS: Mist, Linen and Maize are added in the 5th slot. Semi-transparent with a lid to keep the bobbins dust free. Made in the USA - Bobbins not included! 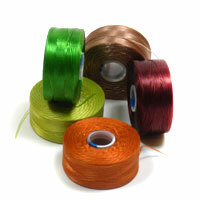 Holds up to 35 C-Lon Bead Thread Size AA bobbins in 5 slots. Semi-transparent with a lid to keep the bobbins dust free. 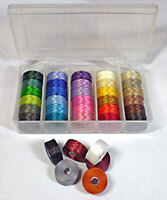 Made in the USA - Bobbins not included- C-Lon Bead Thread Size D shown in box!